Figures from the official body for Cognac show exports from the famous French appellation continued to grow with a three year streak confirmed for 2017, when exports reached their highest ever levels in both volume and value. In total, around 197.4 million bottles were exported last year, resulting in a turnover of £2.79 billion (€3.15 billion) – an increase of 10% in volume and 14% value. 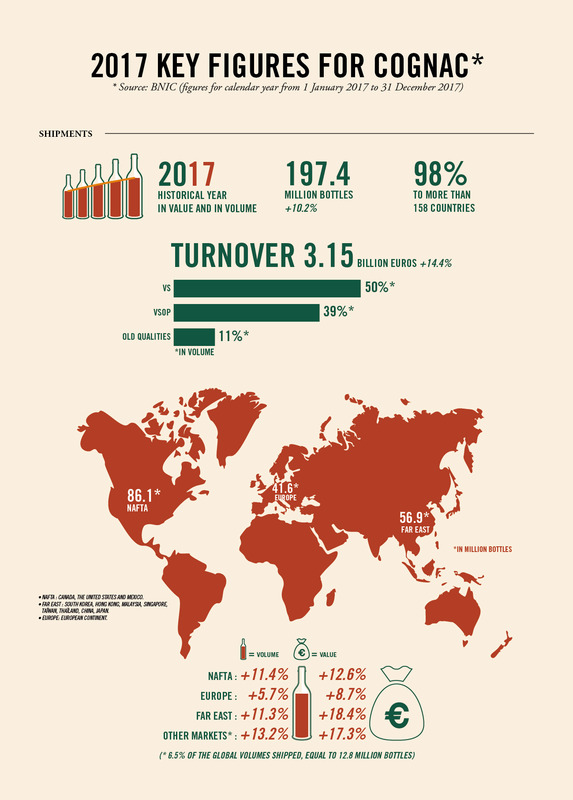 Performance was driven by the countries bound by the North American Free Trade Agreement (NAFTA), in particular the US, which continues to be Cognac’s largest market with 82.6 million bottles exported in 2017. The NAFTA zone, incorporating the US, Canada and Mexico, in total now account for 43.6% of exports. The second highest delivering region was the Far East (28.8% of total exports) which grew to 56.9 million bottles, up 11.3% in volume and 18.4% in value, driven mainly by China. This is followed by Europe (21.1% of total exports), where shipments grew by 5.7% in volume and 8.7% in value, equating to 41.6 million bottles. The UK came number four on a list of the top ten direct shipments worldwide in 2017 with 9.9 million bottles, albeit far behind the largest shipment to the US at 82.6 million bottles. With nearly 98% of production exported, the BNIC is also looking at developing emerging markets such as Africa and the Antipodes, with the rest of world segment outside the key markets seeing growth in 2017 both in terms of volume (+13.2%) and in value (+17.3%). According to the BNIC, new areas of opportunity represent more than 6.5% of global volumes shipped, or nearly 12.8 million bottles. 2017 also saw the consolidation of VS cognac, which accounted for half of all cognac shipments last year. VSOP and older categories also continued to grow, rising by 11.2% and 14.3% respectively in volume, and +11.1% and 17.1% in value. Harsh frosts and reduced yields last year are likely to impact production for the 2017 harvest, the BNIC admited, with a total volume yield of 88.95hl vol./ha compared with 101.94 hl vol/ha for the previous harvest.